BBS Timbers Ltd. have been importing durable hardwoods from around the globe for heavy construction and infrastructure projects for the last 30 years. Hardwoods such as Greenheart, Purpleheart, Jarrah, Kwila, Vitex, Wallaba and Iron Bark for bridge, wharf and railway construction. In more recent times there has been an increasing demand for durable hardwoods for both domestic and commercial landscaping projects, as well as boardwalks around waterfronts and parks. 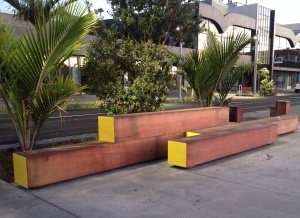 New Zealand grown Saligna (eucalypt) is commonly used as seating on parks bench seats. The South American hardwoods, Greenheart and Purpleheart have been more recently used in Auckland’s Viaduct basin. Typical sizes used for these applications are, 150/200x50mm and 200/250x75mm; however, we stock Purpleheart & Greenheart in sizes up to 300x100mm. For those projects that need larger sizes we can source the timber sections from our suppliers.